I'm Rommel Juan of MDJuan. FYI. 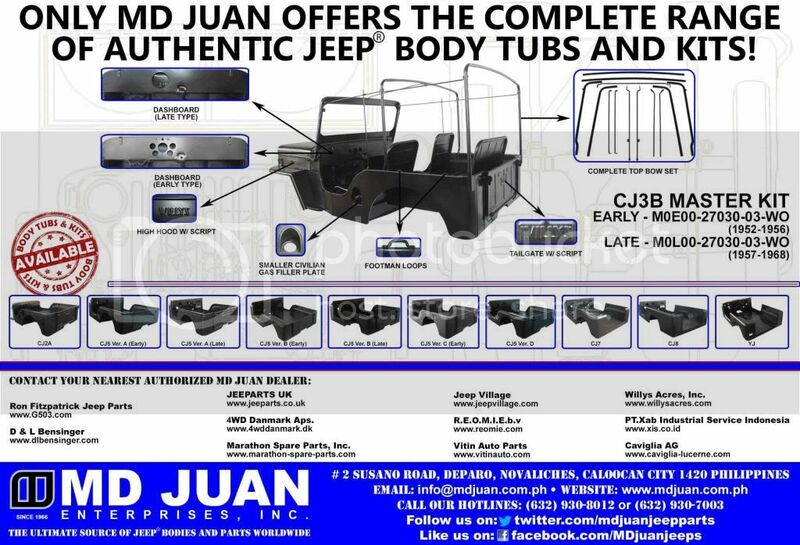 Here's our latest ad for people who need Jeep tubs. Hi Rommel, cool name by the way! Just my .02 on MdJuan tubs. While I and many other appreciate that you guys still make these, I think t you'd sell many more if they were actually correct reproductions. I've heard so many stories about these that I don't think I could ever buy one. Did you know that an original windshield does not fit your tubs? I had a repro hood from you guys for a while that was 1/2 narrower in the back than the stock hood. These are just two examples. Just food for thought. I think if you made them more accurate, you may even be able to get more out of them. I foresee this is going to be an interesting thread. I just hope Mr Juan takes it all in. 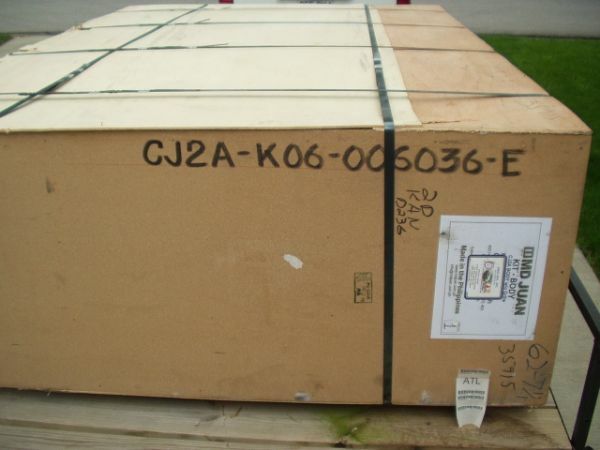 Are talking about our CJ2a tubs? We have a very original CJ2A in the plant which we use as a guide. I'll check the windshield fit tomorrow. Do you know what was the year of production of the tub that did not fit? We have fixed many problems in recent years. Thanks for the comment though. 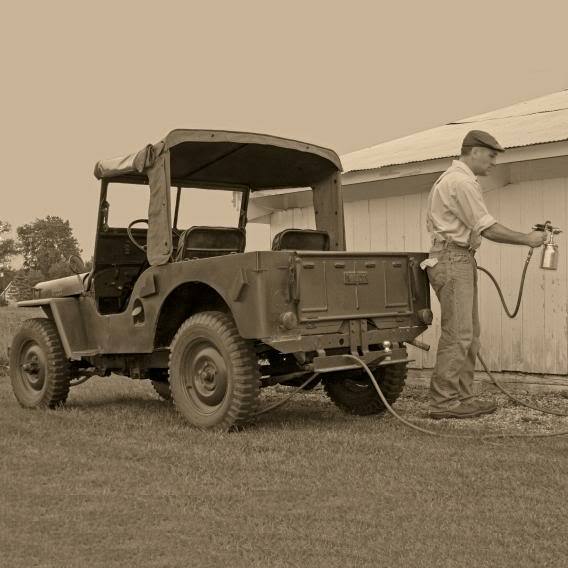 We always welcome comments and suggestions that can improve our products to help the Jeep community restore their beloved Jeeps. Some of the more obvious missing pieces include top bow brackets, gas tank strap bracket, missing "jeep" script on the tool box. That being said the tub I purchased worked pretty well. I bought a kit which included all the body components except grill. Willys Overland had taken an MD Juan tub and had reworked the tub by drilling all the "correct" holes, inserting crush sleeves etc. This was all done to "guarantee" an exact fit. Exact---no. Pretty close though. That was about 15 years ago so hopefully more improvements have been made. Proud father of a Marine, Army Dentist, Navy Pilot and a Princess. LIFE IS GOOD! Welcome to the forum. I think it is very good that you joined the forum as you will find that many members here use your products. I am thinking that the number 1 problem with the CJ2A tub is that the location of the transmission tunnel is off and it has been standard practice by the end customer to relocate the opening. Perhaps one of the members here can post an example. Secondly, the profile of the cowl does not always match that of an original windshield. The common advise here on the forum has been, if you are going to buy a new tub that you should also buy the reproduction windshield. I am traveling or I would post some examples and links to prior conversations. Help me out guys. Again, looking forward to working with you and I hope we can resolve some issues. I have one of your MB full body kits but I have not used it yet. I also think there would be a market for replacement tool indent panels if you were to make them. Hi Rommel, You are at the right place if you're looking to improve your products! It took me lots of work to get my tub to sit correct on the frame and line up for installation. The transmission hump was a real problem, at least 5cm off. My ability to use original hood, fenders, windshield and tailgate where a very big challenge getting them to work with your tub. Many other little things, but overall I have been very pleased with your product. If you could correct the "major" flaws, you would probably increase your sales...and reputation. I'm just glad I had the option! Keep up the improvements! I think you'll get good feed back here. Perhaps you could tell me when this one was manufactured, and how or what you have changed since this period of tubs. Like I said, overall I was pleased with the product, but you could improve it even more if you want to! Thanks for coming to this site and being open to read and understand the comments made. Some of this may be old data. Have you made some recent design changes? If so, tell us about them please. I used on of your CJ2A tubs but I had to have your good customer at Willys Overland in Toledo Ohio Tweak it on a jig to make it fit correctly. I watched his employee make the changes, drill the holes etc., Probably took him less than an hour. I would think that a few minor production changes would reduce the time to a few seconds. Then you would be exporting true "bolt on" tubs. Thank you for considering my suggestions. Thanks for all the comments guys. I will discuss all of this with our team and have an update for all of you by next week. But please keep them coming. We will take note of them one by one. Another recent project. I sent you a PM over on the g 503 board with some comments. Perhaps a set of jigs similar to what the Toledo guys use should be used in your factory? It seems obvious to the end user there needs to be a way of checking fit before the tub leaves your factory. 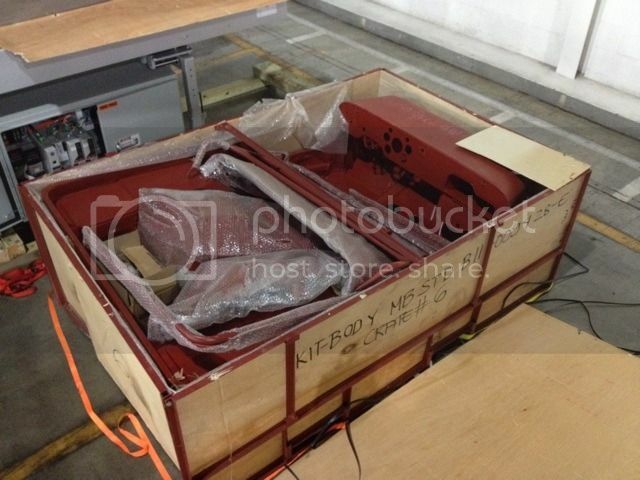 IF you do do the improvements needed PLEASE do something to identify those tubs as the new model. A date code stamped in somewhere and a serial number would be an ideal solution. Perhaps a bonded on ID plate on the underside of the cowl might be a good idea. Real Ecoat primer or the option to get a tub in bare steel would save the expense of media blasting a new tub. Complaints about your primer quality and adhesion are common. How large are your presses used to stamp tub pieces out with? Some folks have discussed your production methods as a bunch of guys swinging hammers over wooden forms, and others claim you have modern presses similar to what is used in Detroit....can you tell us about your plant? Thank you for opening the discussion. It could be a turning point for your products. These civillian jeeps are no longer the stepchild of the jeep world, and Cj2A and 3A owners are every bit as fussy as the military guys when it comes to being correct and right, as well as proper fit. It is no longer Jed and Bubba just trying to keep that old jeep on the road. Now the jeep gets critiqued and shown at national shows, wher guys with tape measures crawl underneath and check obscure features. Add to that the fact that WIllys liked to change stuff without telling anyone, and we are discovering features that changed over the years previously unknown, and you may have a similar chart of body tub features to the one WWII guys have. See what I mean about the reputation your products have? James is not the only one with opinions like this. He may be blunt,but honestly that is what many folks think of your tubs. On the other hand, a MD juan tub from today is a far cry from what we had available to us in the early 70's. I have a 3A tub in my garage right now that is an incredibly poor copy of the real thing, and thin metal has all but evaporated away in the floor pan. "The bitterness of poor quality remains long after the satisfaction from getting a cheap price fades away." We can make the jigs. Just help us identify the corrections to be made. Serial numbers are no problem, we have been putting them on our tubs. So we can just inform people what number the improvements start with. We have various machine presses. the biggest is 1200 tons where we stamp the rims, the floorings, the hoods, fenders and other big stuff. I'll post pictures of our plant here so you can hav an idea. here are some pictures that our french dealer Jeep Village took last year when they visited us. I see this thread as a golden opportunity to improve a product that there is definately a market for. Lots of people don't have the fab skills to fix an original and metal/body work costs can take off in a hurry. This will always be a debate but ultimately it will be the owners choice. Jpet, just to name one has proven here time and time again that reverse engineering parts can be done very accurately. I hope Mr Juan doesn't make the mistake I see out of most management I deal with....the mistake of 'we are the all knowing' then come to the masses and say 'here's what we've done now you fix it to give us satisfaction'. If they had just asked the proper questions before (instead of being all knowing) they wouldn't have had to have us 'fix' their screwup. I think this is a great opportunity. 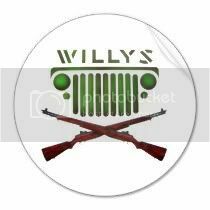 I would suggest that a factory rep might want to visit Willys Overland. I would think with the volume of corrections they do to these tubs, It would give them quite a leg up on the problems.